Investigation: Rowbottom Farm, Spalding | Viva! Rowbottom Farm is based in Spalding, Lincolnshire, and it supplies local businesses with free-range and barn eggs. Scenes at the farm are some of the worst Viva! has seen, dispelling the myth that ‘buying locally’ means buying high welfare. 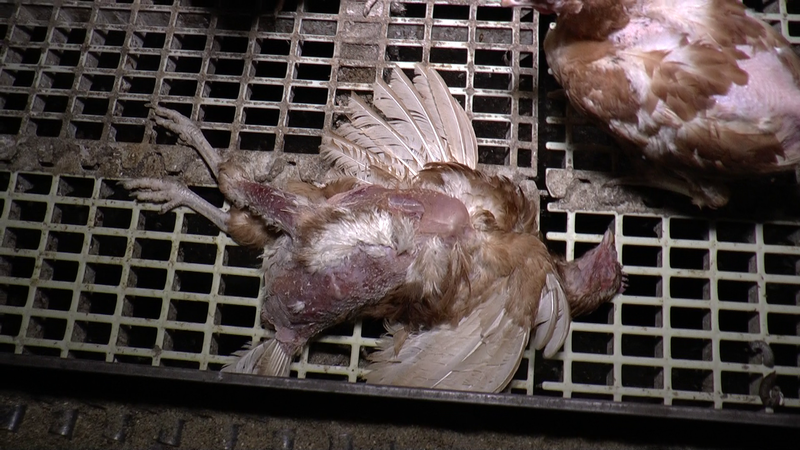 The footage reveals huge, filthy sheds housing hens in shockingly poor bodily condition - one hen with what appears to be an oozing prolapse, and others with extensive feather loss exposing red raw skin. Parts of the sheds had gridded metal, walls filthy, and air heavy with dust. Dead birds have been left to rot on floors, and some clearly had been left for a long time. 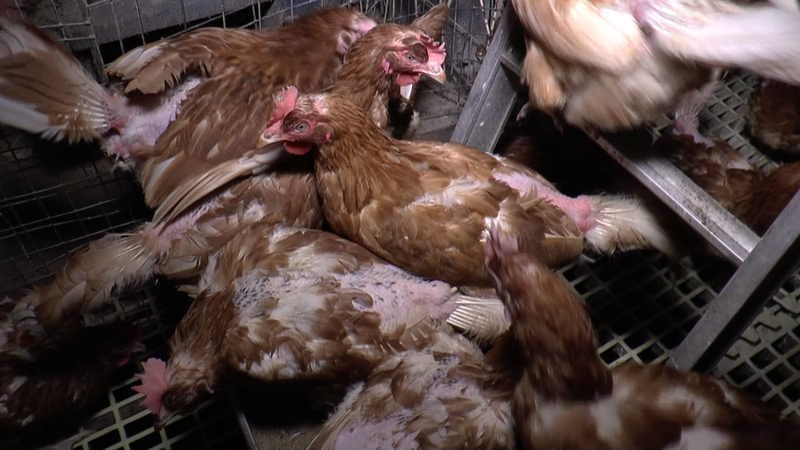 In another dilapidated shed, similar conditions were filmed, and an injured hen who was apparently unable to walk. Currently almost half of the eggs in Britain are laid by free-range hens. Free-range farms have increased in intensification over recent years, and birds who would typically live in small flocks are now incarcerated in sheds with tens of thousands of others. Birds at free-range farms are provided with pop-holes as access to an outside range, however high stocking densities, competition from other birds, and inadequate conditions means birds may never step outside. On a return visit to Rowbottom Farm, only one hen was filmed outside on the range, and it was a sunny day. Based on research and this observation, it could be that many hens never leave the dilapidated sheds. We have reported our concerns to the authorities, but have yet to hear back from them. Viva!’s research reveals Rowbottom Farm to be stocking at least one local business with free-range eggs. 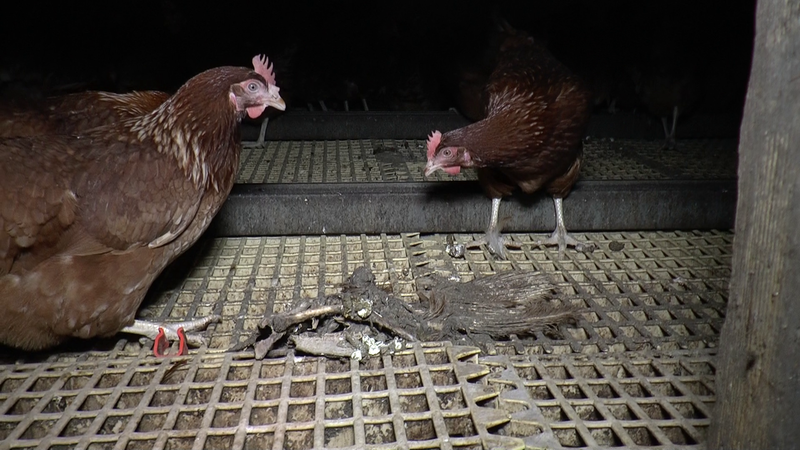 Consumers may believe these eggs are laid in high welfare conditions. As part of Viva!’s Cracked campaign, over the course of a year, a series of investigations were carried out inside enriched cage, free-range and organic egg farms across Britain to reveal the stark reality of life for laying hens four years on from the ban on ‘battery’ cages. Watch the video HERE. Don't leave the protection of animals up to the Government. They sanction factory farms exactly like this one. Take charge yourself and save animals by going vegan. Investigation by Viva! Campaigns Ltd.